The Rebel Sweetheart. 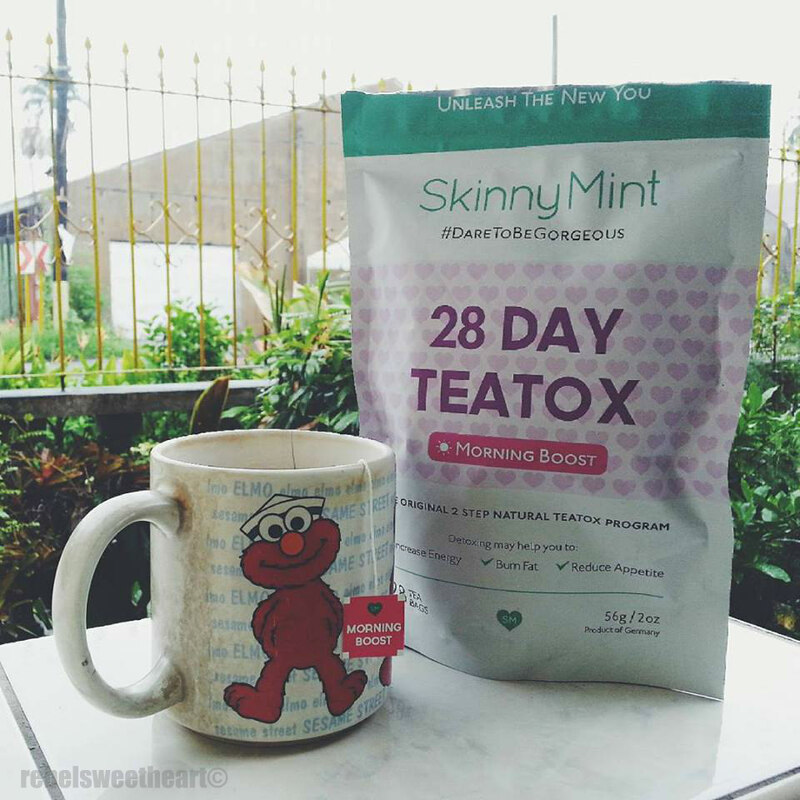 : Spotlight | Skinny Mint TeaTox. And just like that, we're down to the last day of August! It's September tomorrow, and the next thing we know, it's almost Christmas! Now before this day officially ends, allow me to share with you my Skinny Mint TeaTox experience. 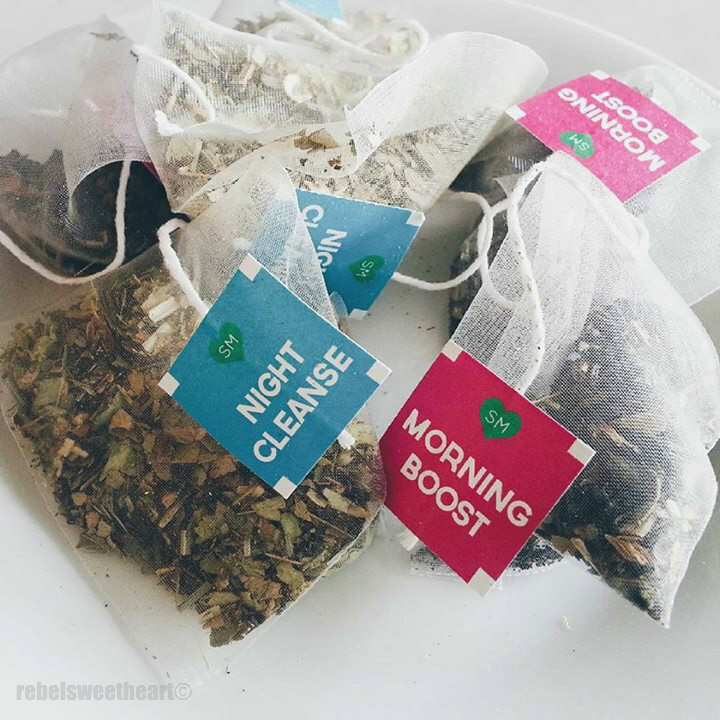 If you're following me on Instagram, then you've probably chanced upon my Skinny Mint photos and how this product has made me into a tea convert. (Insert expressions of shock here, haha!) It's no secret that I'm a coffeeholic, consuming no less than 2 cups of coffee a day. My mornings are never complete without my favorite cup of Joe, and I just have to have a cup of coffee beside me whenever I write or work on a blog post. 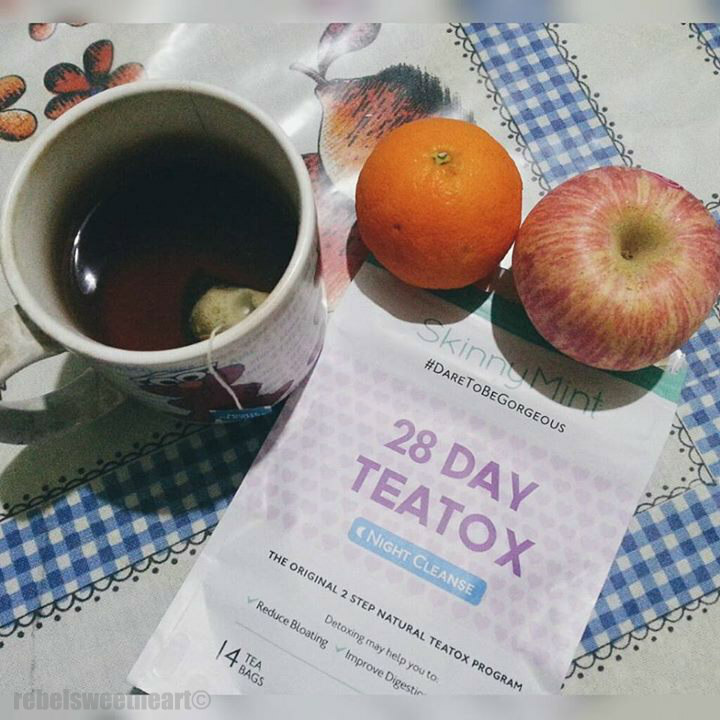 The Skinny Mint 28 Day TeaTox Program. 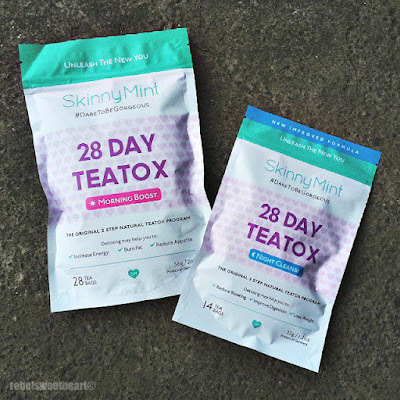 Now when you do the Skinny Mint TeaTox program, you get to drink two different blends of tea. There's the Morning Boost which you take before or during breakfast, while the other is the Night Cleanse, which you take every other night after dinner or before you hit the sack. I love how these tea bags are not made of paper. The bags don't stick to each other, and they don't rip apart. The Morning Boost contains approximately 62 mg of caffeine, which is good since I don't think I can function properly without caffeine in my system. Morning Boost to start your day. What the Morning Boost is made of. The Night Cleanse, on the other hand, helps to flush out toxins overnight. It has a laxative effect, which is the perfect way to wash away your guilt after indulging in heavy meals (goodbye, pizza, pasta, and potatoes, haha!). 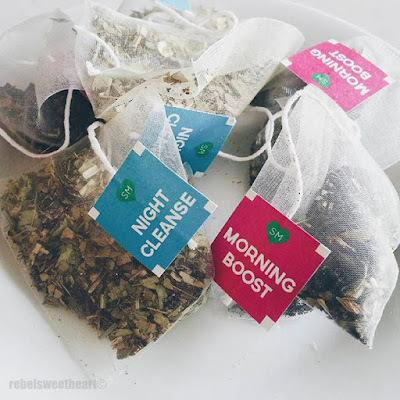 I love how this tea made me sleep better at night, and how it made me feel less bloated. I also love the combination of ginger root and orange leaves in this blend - very soothing to the throat, and very aromatic, too! It's been almost three weeks since my teatox program ended, and I'm quite happy with the results. Say hello to my 17-year-old Elmo mug. Now if you would like to try the Skinny Mint TeaTox Program, simply visit the Skinny Mint website to order. You can pay via Paypal or with your Visa, Mastercard, or American Express credit card. The best part? It won't take an eternity to receive your order, and they ship worldwide for FREE! I'm allergic to some of these teas, but I love ginger root tea before bed. I wish I could use them! Those teas sounds really refreshing. Which one is your favourite? I love that it's labeled with days. Also, that it comes in different flavors other than just getting one bag of the same tea and having to drink it for a month. I think Skinny Mint teas would be a great way to drop a few pounds before the holidays! Adding the Night Cleanse before bed also sounds like a great way to rid your body of unwanted toxins! I really appreciate how it cuts down on bloating. I hate that! I also appreciate the boost of caffeine in the morning. I want to try something like this. I need something to kick some of my sugar cravings to the curb. Thank you for sharing. I just recently gave up coffee and am also a newly-converted tea drinker. I've heard a lot about these teatoxes, but have never tried one before. I like that Skinny Mint can cut down on bloating and it sounds like you have had favorable results with it. How was it delivered to you? Was it delivered to your specified delivery address or did you have to claim it from the post office?